Symptoms like heavy bleeding and painful cramping during your period should not be ignored. These may mean the existence of fibroids in your uterus which may also signal a gynecological condition called endometriosis. This condition occurs when the lining of the uterus, which is shed during your menstrual cycle, is located outside the uterus. If endometriosis is not diagnosed early enough, it can cause complications which may lead to an impaired ability to have children, or worse, infertility. The menstrual cycle is very good indicator of a woman’s overall health status. Most menstrual problems are normal and temporary, including heavy bleeding, severe pain, and irregular cycles. But in some cases, these problems may also signal problems in the body. It is important to know which problems are normal and which are cause for concern. What is regular and normal varies from one woman to the next. One of the most important factors is a woman’s age. Irregular cycles for the first two years are normal for adolescents who just started having their periods, and the same goes for women just before menopause. The irregularity is caused by fluctuating levels of hormones, stabilizing for adolescents, and declining for menopausal women. Between this age-range, regular monthly cycles can be expected, although some minor variations may also be considered normal. Irregularities only occur if a woman is pregnant, ill, under medication, or is under stressed. The number of days between menstrual periods falls between 22 and 40 days, with each cycle lasting between two to eight days, with a variation of plus or minus five days. If a woman who normally has a 40-day cycle suddenly shifts to a 22-day cycle, it could signal a problem, or if your period lasts shorter or longer than your regular pattern for several months. Significant changes like these should not be ignored. A three-month period of observation is best to gauge whether or not there is a cause for concern. Always consult a doctor for a more definitive and expert evaluation. Only a doctor can conclusively diagnose any problems you may have, but you can also find out if something is wrong with yourself by keeping track of your menstrual cycle. The more detailed information you have, the better you can figure out if something is abnormal. The following are the important details you should take note of. The number of days between the first day of one cycle and the first day of the next cycle. The number of days between the first and last days of your cycle. How heavy your bleeding is and the heaviest days in your cycle. If you have spotting between cycles and when. If you have pain and where and when it occurs. Other symptoms like headaches, backaches, stomach problems, fatigue, dizziness, or unusual vaginal discharge. Having a record of your periods is very helpful for both you and your doctor in determining what is normal and abnormal and what may be causing the irregularities. They may point to pregnancy, tell you to be more careful about birth control, when you’re ovulating, or if you are having perimenopausal symptoms. At the end of the day, you know your own body better than anybody else. When you consult your doctor regarding menstrual-related concerns, you may have to undergo several examinations, including a pelvic exam, a pregnancy test, a check of your vital signs, urinalysis, blood tests, and even a vaginal ultrasound for a closer look at the uterus and ovaries. The type of exam will depend on your symptoms, age, and medical history. That is why it is very important that you tell your doctor and your family’s history of disease. It is also important that your doctor knows any relevant details about your lifestyle, like your diet, exercise, or any emotional distress. A young woman should have her period by the age of 16. If menstruation has not occurred by this age, a doctor evaluation is necessary. Many factors may contribute to this abnormality, including hormonal problems, excess stress or exercise, under-nutrition, or eating disorders. More serious factors include genetic disorders, problems in the nervous system or pituitary gland, ovarian tumors, ovary failure, or under-formed reproductive organs. For those women who have always had regular cycles and suddenly missed a month, the first rule-out is always pregnancy. A doctor should be consulted immediately. If pregnancy is not the reason for the irregularity, other reasons that may be considered by your doctor are breastfeeding, use of medication especially contraceptive pills, menopause, stress, poor nutrition, eating disorders, extreme weight loss, sudden weight gain, obesity, an ongoing illness, depression, or hormonal problems. However, it may also be normal to miss one or two periods in a year, especially if the next cycle is heavier than usual. The heavy bleeding is caused by the buildup of unshed uterine lining from the missed month. But missing two periods in two consecutive months is not healthy and puts you at risk for uterine cancer as a result of excessive estrogen. If you miss your period due to a lack of estrogen, on the other hand, your risk of developing osteoporosis is increased. For women who are trying to get pregnant, irregular periods is a great cause for concern because these women usually have problems ovulating properly. There are many reasons for bleeding in between periods, some may signal a serious problem, while others can be easily addressed. If spotting occurs for a prolonged duration, for example, or in girls who are younger than 10 years old, during pregnancy, or after menopause, you should see a doctor right away. Women who use birth control pills are susceptible to light bleeding between periods when they do not take their pills regularly. If the dosage of the birth control pills is not correct, bleeding before the week of the regular cycle may also occur. In both cases, the progesterone levels in the body are not high enough. Again, doctor consultation and evaluation are necessary. If you are on the contraceptive Depo-Provera, minor bleeding can be expected. Other possible causes of spotting include breastfeeding, over exercising, hormone irregularities, pregnancy problems, ovulation, perimenopause, or the use of an IUD. Women who bleed heavily during their cycles are susceptible to anemia. However, the heaviness or lightness of periods varies from one woman to another. A heavy or prolonged bleeding may not be normal for one woman but is normal for another. As long as you get regular pelvic exams and blood tests, you may not have to worry about periods that become heavier and thicker over time. Your doctor can advise you about preventing anemia or controlling your bleeding. Some women may be concerned about the thickness, heaviness, or length of their bleeding. But a woman’s assessment of her own blood loss is highly subjective. They may be worried about blood loss that they perceive to be too much but is actually within the normal range. However, consulting a doctor is always helpful. He would need to know how much tampons or pads you use every hour or every day. If you are changing a full tampon or pad every hour, this may signal a problem. Blood clots that come out during menstruation are also normal as long as they don’t happen for a prolonged period, during pregnancy, or in between periods. The clots normally form during sleep, when the blood collects and comes out thicker in the morning. If you have concerns regarding your bleeding, always see a doctor. Other causes of heavy, thick, or prolonged bleeding include uterine fibroids, uterine cancer, obesity, reproductive problems (i.e. endometriosis), hormonal irregularities, blood disorders (i.e. von Willebrand’s disease), aspirin overdose, and contraceptive use. Menstrual cramps, whether we like them or not, are a part of many women’s cycles. The cramps are characterized by a dull or throbbing pain in the lower abdomen. They are caused by the contractions of the muscles as they push out the uterine lining. Painful menstruation is one of the most common reasons for missed work among women. However, intense, prolonged, or unusual pain beyond the normal menstrual cramps may signal other problems, like endometriosis, pelvic inflammatory disease, problems with your IUD, or uterine fibroids and polyps. 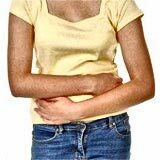 Severe menstrual pain may be a cause for concern if it disrupts a woman’s normal daily activities, or if it happens a week or more before her cycle starts, continues after her period starts, or happens in the middle of her cycle. If the woman is on painkillers to manage menstrual pain, usage may also point to a problem. Normally, a woman would need to take the medication three days before her period starts and the first couple of days of her flow. But if she needs to take her painkillers for a whole week, the week before or the week after, this could be something to be worried about. The type, severity, and radiation of the pain are very helpful details a woman should give her doctor. Natural and holistic treatments such as herbal and homeopathic remedies may also provide symptomatic relief for menstrual disorders. Herbal and homeopathic remedies are safe and gentle to use for the body, and also promote overall health and well being. Herbs such as Dong Quai (Angelica Sinesis) encourage hormonal harmony throughout the menstrual cycle while Pulsatilla vulgaris (Pasque Flower) helps to support the female reproductive system. The menstrual cycle is very good indicator of a woman’s on the whole health condition. So any problem faced during this time should not be ignored.